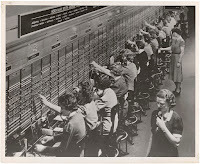 Misfirings and mis-timings of a number of systems affecting: hormones, neurotransmitters, and immune system cycles that go off-kilter; glitches in communication between brain cells and within brain cells; and wonky wiring among the networks that connect the thinking, feeling, and evaluating parts of the brain -- that's bipolar disorder in a nutshell. Okay, a very full nutshell. Last week I explored one example of hormone cycles gone off-kilter, cortisol. This week, we go inside cells to discuss my favorite little critters, mitochondria. 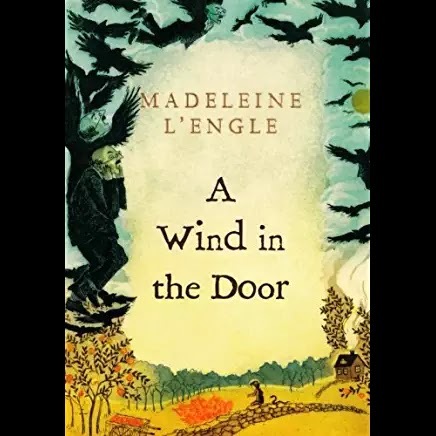 I first learned about mitochondria from Madeleine L'Engle, from the second of her Wrinkle in Time series, A Wind in the Door. Charles Wallace is sick, dying, because of a problem inside his cells. His mitochondria are not doing their job. Mitochondria are organisms (technically, organelles) that crawled inside the cells of animals back when animals were being formed out of the ooze. It is a beautiful relationship. We are their hosts and meal ticket; they are the power plants that convert food into energy. If they don't work well, neither do we. Since the brain uses bucket loads of energy, a problem with energy production has serious consequences for anything the brain is supposed to do. Lots of genes implicated in bipolar code for mitochondria, particularly in the hippocampus. Memory formation, emotional regulation, focus, these are hippocampus tasks that suffer when mitochondria in the hippocampus aren't up to snuff. Mitochondria play critical roles in communication between cells, modulating communication, and controlling neurotransmitter release. They participate in the creation of new brain cells and the death of old ones. 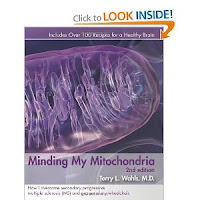 Poor mitochondria functioning may be involved in oxidative stress, read: the equivalent of ten years premature aging. So, like, let's take care of these critters! The die are loaded against them by our genes. But there are ways we can tilt the odds back in our favor. People who take medication have better looking hippocampi than those who do not. But once again -- there's more we can do. Life style, life style, life style. This is not my first post about my favorite little critters. Minding My Mitochondria, my review of a book by Dr. Terry Wahls, is my all-time most read post. Dr. Wahls, confined to a wheelchair by MS in 2007 outlines an eating plan that helped her get onto a bike in 2008. It's all about mitochondria. The diet is applicable to anyone with a disease related to mitochondrial failure, like people with bipolar disorder. I have adopted parts of the diet to the extent that I am able. Dr. Wahls has modified it since, acknowledging that whatever steps a person takes in the right direction are better than staying stuck in eating habits that are harmful. Simply put, when I eat my veggies, lots and lots of them, my brain fog lifts. I have energy for life. 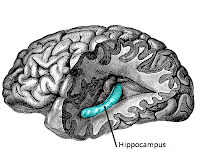 Bipolar is a systemic and global condition, involving many systems in the brain. But there are work arounds for many of the issues. Next post goes after the wonky wiring.